At a small club in Houston, a cop entered the club to investigate a noise disturbance. 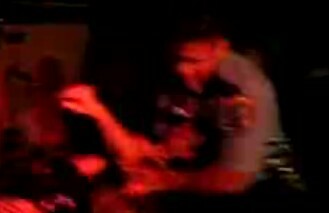 Reports are coming in that, instead of having the decency to talk with the management, the police officer walked directly up to the stage and slammed a musician to the ground. Not stopping there, this police officer then tasered three people just for kicks. This rampant abuse of authority, which resembles behavior that I was subjected to earlier this year by San Francisco’s “finest,” is uncalled for in any context. There were numerous peaceful methods that this officer could have employed to deal with the situation. But instead of talking reasonably with the club owners or the crowd, he gave into stress, pressure, violence, or who knows really, and created a situation that escalated out of control. I sincerely hope that the victims of this officer’s abusive behavior plan to file a report against the officer and that they do not remain silent. I am being blitzed by both the Houston police and the CIA in a joint effort to entrap me since I have nothing illegal going on. Is there some way to sue these organizations who are starting to resemble Nazi’s? I am gathering sufficient proof of there illegal activities against me; I am obviously just one of hundreds of citizens being targeted to fulfill their quotas in order to justify their paychecks and further their project “big Brother” I won’t go into detail here but their tactics are bluntly stupid to a trained eye or someone with above average commonsense.